Selling in today’s transportation and logistics environment is harder than ever. The sales leader plays a key role in developing their team, yet just 38% of salespeople say their manager helps them develop the skills they need for success. Equally important, transportation sales reps say they are constantly challenged with access to qualified leads and ultimate sales wins due to lack of strategy, training, and structure. The 2019 TMSA Sales Training Workshop provides content and connections to address these issues. 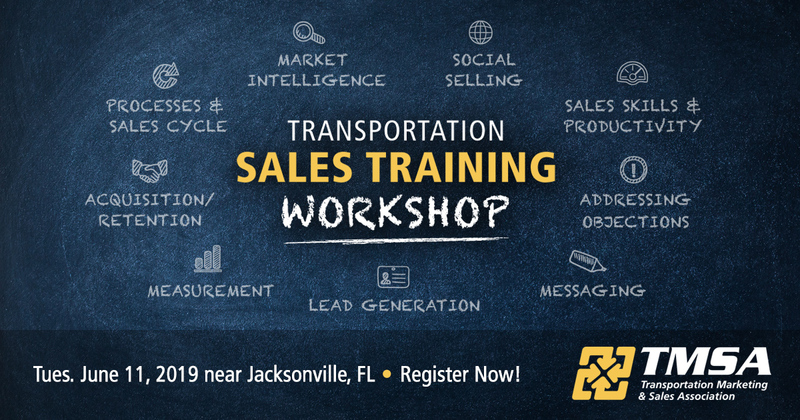 Designed specifically for Sales Leaders and Sales Reps in transportation and logistics, this workshop takes place Tuesday, June 11, in conjunction with the TMSA Logistics Sales & Marketing Conference at the Omni Amelia Island Plantation Resort, just north of Jacksonville, Florida. How to navigate and respond to objections – including price! Note: If you are already registered for the annual TMSA Logistics Marketing & Sales Conference (All-Access or Early Exit Pass Options), this Sales Training Seminar is included in your fees.